1 Preheat the oven to 190°C, gas mark 5. Place the raisins in a bowl, pour over the rum and leave for 20 minutes. Melt 40g of butter in the microwave for 30 seconds, then mix with the breadcrumbs. Stir in the demerara sugar, cinnamon and lemon zest. Blitz the walnuts in a food processor and set aside. Peel, core and finely slice the Bramley apples. Put them in a bowl and toss with the lemon juice. Melt the remaining butter in the microwave for 30 seconds. 2 Lay 2 clean tea towels on the work surface and carefully place one piece of the rectangular filo pastry horizontally on top. Brush the filo all over with the melted butter. Lay a second piece of filo horizontally with a slight overlap on the first piece along the middle and brush with melted butter. Add a second layer of filo by placing the sheets vertically with an overlap running down the middle and brushing well with melted butter. Add a final third layer placing the final 2 filo sheets horizontally (exactly the same as the first layer) and brushing with melted butter. 3 Sprinkle the breadcrumb mix onto one half of the large filo square. Spread out the apple slices on top. Next, scatter the raisins and grated walnuts onto the apples. 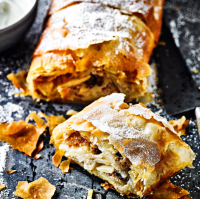 Fold the edges of the filo pastry over 3 sides (top, side and bottom) of the apple filling and then, using both hands, roll the strudel. 4 Brush a baking tray with melted butter. Place the strudel onto the tray, then brush the whole strudel with melted butter and place in the oven for 30 minutes, until golden and crisp to the touch. Leave it to cool for an hour, dust with icing sugar and serve in large slices with whipped cream.